You are here: Home / Blog / Blog / Visiting Galway? Are you thinking about coming to Galway and hoping to take in the beautiful sights that the Connemara region has to offer? Afraid you’ll miss out on the main parts of it? Don’t worry, we at Galway City Hostel have written your own personal guide to ensure you get the best out of your trip that you can!! Connemara lies just north of Galway and is full of unspoilt and varying landscapes. The regions natural beauty is simply breathtaking with its jagged coastline and hidden beaches, the rugged Twelve Bens (a.k.a Twelve Pins by the locals ) mountain range surrounded by windswept bog lands, as well as lakes and rivers! There are a variety of activities that you can partake in here such as hill walks, cycling, hiking, fishing, golf, horse-riding and even scuba diving. The Emerald Isle shines brightest here as you breath in the fresh sea air and escape the city. Within the 1,000 acre estate nestled beneath a mountain range, overlooking a lake towards several of the Twelve Bens is where you will find Kylemore Abbey completed in 1871. The Victorian Walled Garden completed in the same year was so advanced for its time it has been compared to the Kew Gardens in London. With a history that spans 150 years there is much to learn about the tales of romance, tragedy, courage, sadness and folklore. Upon entering the ticketed area of the Kylemore estate you have the option of taking the free shuttle bus or walking along the nature trail to the magnificent 6 acre Victorian Walled Garden. Return to explore the restored rooms of the Abbey and learn about it’s history including what the Benedictine Nuns did within the estate since they bought it in 1920. Continue on through the woodlands and along the lakeshore to the beautiful Gothic Church and Mausoleum. There is a large stone and an amazing sculpture that lie a couple of minutes walk past the Mausoleum; ask at the ticket desk about the folklore behind this mysterious and often unvisited spot. If you arrive peckish, Mitchell’s Café welcomes visitors 7 days a week, all year; an entrance ticket to the Kylemore Abbey estate is not required to dine there. Located by the Walled Gardens is the Tea House which is only open during the Summer months; an entrance ticket is required to get there however. We suggest taking a packed lunch though and sitting at one of the many peaceful and scenic locations around the estate. Please not if you you book in advance online at http://www.kylemoreabbeytourism.ie/ you will save 10%! 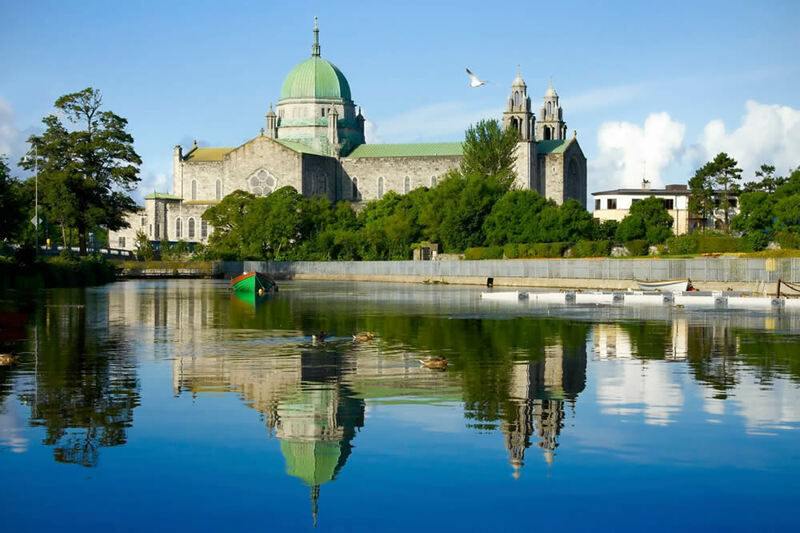 By Public Transport: We recommend joining one of the tour companies that departs Galway daily as the public the Citilink bus will only take you as far as Letterfrack and then it is another 5km walk to the Abbey along a winding, narrow road busy with traffic. looking up at the mountains or hike through the park and over the mountains you are certain to be left speechless. This is one of those places in the world where photos, just don’t do it justice – you have to see it for yourself to see its true beauty! location. There are four trails that can be accessed directly from the visitor centre and there is even a playground at the base for children and Tea Rooms for those that simply want to admire the view. Admission is free into the park and is open all year round. If you are after a bite to eat before your climb or need to restore your energy with food after you return from the peak there are few options to choose from. Within Letterfrack there are a couple of restaurants or pubs, a supermarket or at the Visitor Centre you can purchase lights snacks at the café. We highly recommend taking a packed lunch and eating at the peak of Diamond Hill though so you can admire the view for longer. By Public Transport:​ Citylink run a daily service to and from Letterfrack dropping you off and picking you up within a short walk of the Visitiors Centre. Click here for bus times and prices! colourful storefronts, fine restaurants, tea-shops and a buzz with tourists and locals alike. souvenir stores to meander in. By Car: Take the N59 for Clifden out of Galway and follow the Wild Atlantic Way signs in Clifden that lead to The Sky Road. Ask our reception staff for the variety of tour options that take you to see stunning Connemara. Or if you have a car, be sure to swing by reception and we’ll give you a map and show you our favourite spots. Wild Atlantic Way Tours take in the Sky Road on their tour and Galway Tour Company go around the outskirts of the National Park stopping in Cong where The Quiet Man was filmed, both allowing time to visit Kylemore Abbey and both highly recommended. http://www.galwaycityhostel.com/wp-content/uploads/2018/01/galway-cathedral.jpg 666 1000 steve http://79.170.44.106/galwaycityhostel.com/wp-content/uploads/2018/01/logo1.png steve2018-01-21 18:56:262018-01-23 17:29:11Visiting Galway?